Media coverage of Jameis Winston and Marcus Mariota as the top two quarterback prospects in the class and the obsession of whether or not a running back will go in the first round have overshadowed Grayson and his potential to become a quality NFL starting quarterback. This isn’t me professing that Grayson is in any way, shape, or form better than Winston or Mariota. What I will say is that if you’re a team looking for a quarterback with a good, accurate arm Grayson may be someone you want to keep in mind in the third round of this draft. Because what he could become is just as good, if not better, than both Mariota and Winston. I’m looking at you Buffalo, Cleveland, New York (Jets), Philadelphia, Chicago, and Houston. Part of what I try to do is look at the numbers and tell you a story of what a player can be, will be, or is. If there is a writer/blogger/analyst today who eschews numbers I would tell you to avoid giving them your attention because you aren’t getting the complete picture of a player. Conversely, numbers don’t tell the entire story so one has to be careful when using them as their sole method of evaluating players. First, his 4:1 touchdown to interception ratio present a player capable of limiting mistakes with his passes. Second, the accuracy of those passes (63% 2013-2014) proves the ratio can be taken seriously as he attempted 898 passes and was still able to complete them at well above a 50% clip. 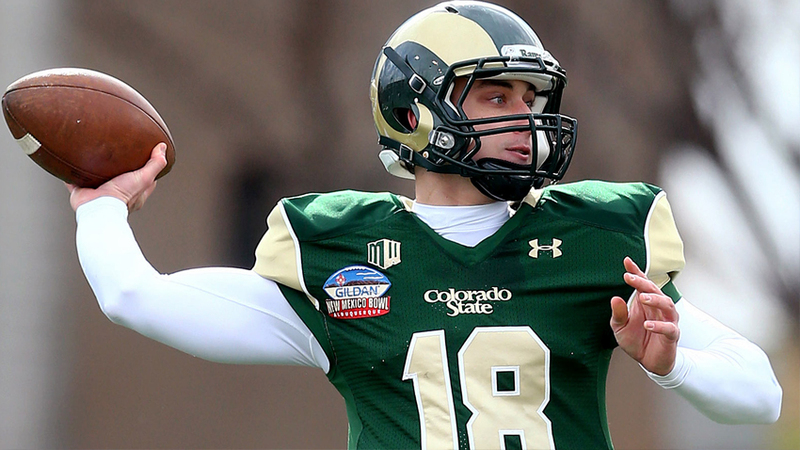 Grayson ranked in the top-10 in passing yards, passing efficiency, and touchdowns while leading Colorado State to a 10-win season. The numbers are there, and fit the expectation of the scheme brought in by then Colorado State coach Jim McElwain: sharp on the short, intermediate passes with the capability of burning a team deep. Numbers, though, have been there for plenty of quarterbacks before, so now we need to see what he has on the field. We all know numbers come with questions. Particularly, questions revolving around the level of week-to-week competition. 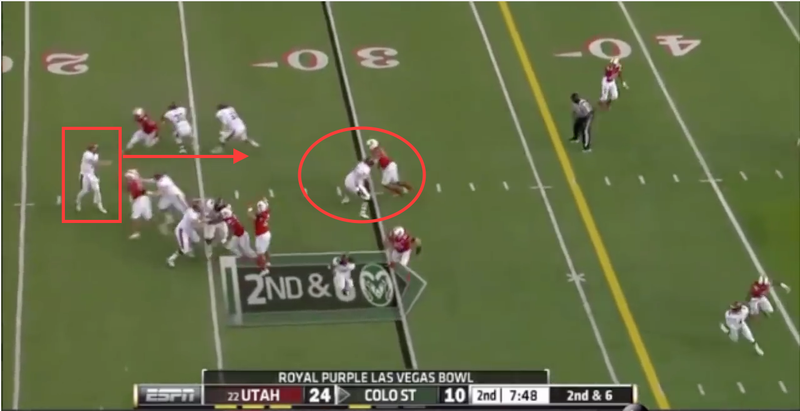 With that, I chose to take a look at Grayson’s Bowl game against Utah in December of 2014. I chose this game because Utah ranked 43rd in the nation in points allowed per game and went 9-4 (5-4 Pac-12), was Grayson’s last collegiate game, and their pass rush posed some of Grayson’s stiffest competition. Grayson also showcases a good arm; which, as you know, will come in handy in the NFL. The ball gets to the receiver in a hurry and gives his receivers every opportunity to catch it. In this first shot I’ve highlighted the space in front of Grayson that could be had. 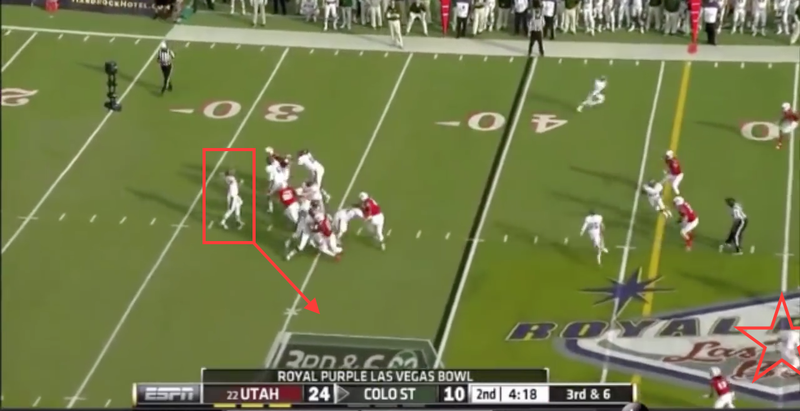 He’s already in his throwing motion here, but had he stepped up and allowed himself time he opens himself up for more options including scrambling for extra yardage or finding a receiver who can create more with extra space. Lastly, we see Grayson a little more confident in his decision but again leaving opportunity to his right for a cleaner throw. 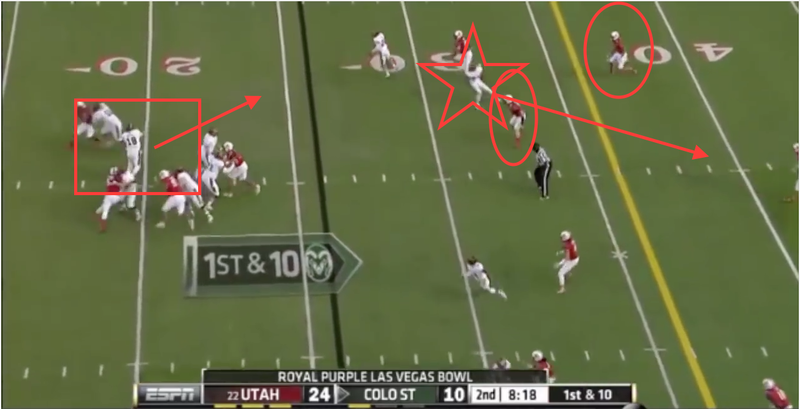 The defender comes right up the middle here and gets a good shot on him, but had he utilized the space the his line gave him he could have hit the receiver (star) who split the defense for a much bigger gain. Overall, I like Grayson’s pocket presence. I do feel that mastering the utilization of space in the pocket and extending plays will benefit Grayson tremendously at the next level. He has a tendency of getting caught on his back foot which isn’t uncommon of quarterbacks with strong arms (Stafford, Cutler, etc. ), but needs to be corrected for Grayson because his arm isn’t in that class. Better movement in the pocket will fix this problem and with better talent at his disposal in the NFL he could be primed as a real Dark Horse for a franchise. Nothing to this point has led me to believe that Chip Kelly isn’t still positioning himself to land Marcus Mariota. If that doesn’t happen then Grayson would make an ideal fit. Kelly loves accurate, coach-able passers who can consume information without much of a problem. If he were to get thrown into the Eagles quarterback mix as it stands an argument could be made that he would be the best of the group outside of a healthy Sam Bradford. Meanwhile the Bills have everything they need to disrupt the AFC East except a quarterback. Greg Roman, the Bills new offensive coordinator, would be a good match with Grayson because apart from running a lot of Pro-Style elements in college he has experience with the Zone Read. If that offense sounds familiar it is the same offense that Colin Kaepernick ran in San Francisco with Greg Roman for a time with success. Both of these teams have a need and both could use a player like Grayson who is NFL ready or will be within a year. Mariota and Winston might get all the press, but don’t be surprised if Grayson, in the right situation, is running an offense in the NFL this Fall.